Birds working. Photo by Kelly Groce. 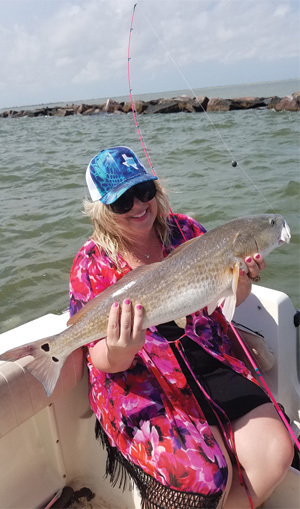 While not the official start of our summertime fishing season, Memorial Day Weekend often offers excellent conditions for both inshore and offshore fishing. For many anglers it is their first run of the year to offshore waters. 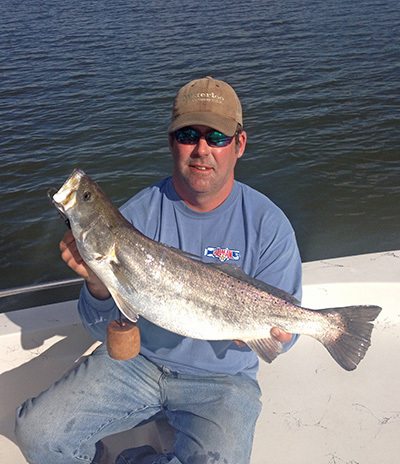 Others focus on the jetties and bays, with all areas capable of producing some nice fish. Most years, the water temperature has reached the 80-degree mark and, while not as warm as in the mid-summer range of July through mid-September, it is at the point when all of our summertime fish are around. The bay waters are not so warm as to keep trout and other fish that are sensitive to dissolved oxygen levels, in deep water. 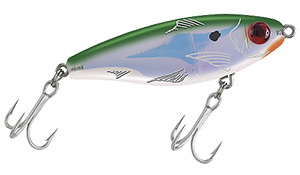 This means that wade fishing the shorelines continues to be a viable option for catching trout, reds and other fish. During May, the jetties begin turning on with trout activity and other fish join the prized specks in feeding up and down the rocks. May through August is prime time around the collection of granite rocks known as the North and South Jetties and many locals add still another designation, that being the Bolivar Jetties for the North and the Galveston Jetties for the South. Regardless of which designation you use, Memorial Day Weekend is a great time to fish them. Bird action in both East and West Bays will continue until the waters warm to the point that the fish go deeper. Normally that does not take place until late June or early July. 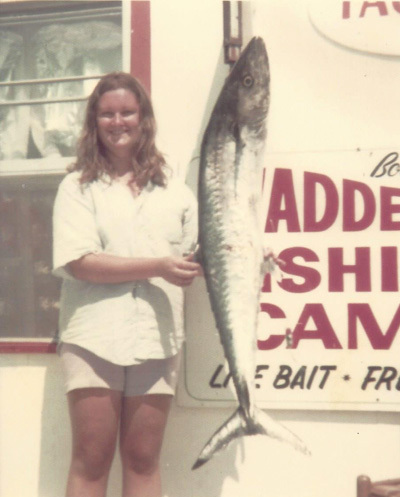 Polly Kent with Joe Kent’s 48 pound ‘smoker kingfish’ in 1972. Memorial Day Weekend is a Holiday Weekend that I always have looked to as the time to head offshore, conditions permitting. My first Memorial Day trip was in 1972 and what a trip it was. King mackerel were thick beginning about 10 miles south of the Galveston or South Jetty. Before that I had made an offshore trip in my boat only four or five times over the previous years. A learning experience it was. One of the largest kings I have ever caught was landed that day. It was a real “smoker” that weighed 48 pounds on the unofficial scales at Wilson’s South Jetty Bait Camp. Wayne Tucker, operator of the bait camp, said the king was one of the largest he had seen. 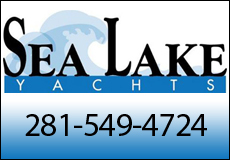 For years thereafter Memorial Day Weekend was set aside for offshore fishing and the percentage of times we were able to make it beyond the jetties was higher than normal for offshore trips. 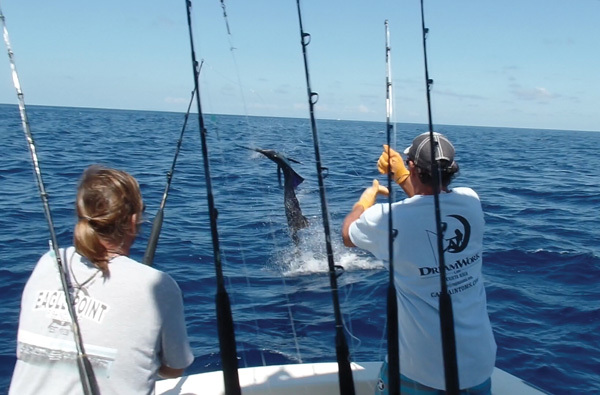 Some of the largest pelagic fish which include kings, ling, sharks and Dorado make it to the shallower offshore waters during May and early June, with Memorial Day right in the middle of that timeframe. Besides good fishing and statistically good weather, the Memorial Day Weekend does not normally have the intense heat we experience later in the summer. One advantage of fishing offshore during this time is that the crowds are much lighter than for inshore fishing. 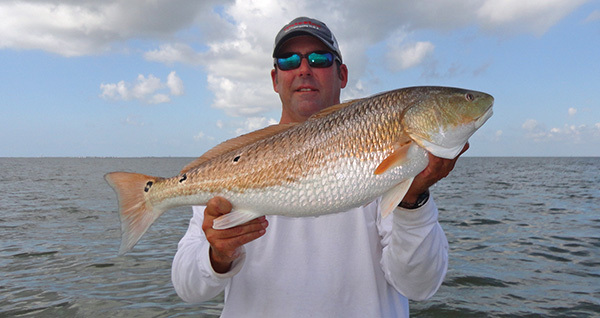 While inshore fishing is in its prime, the weekend is one of the busiest on the water. Normally, that does not bode well for fishing and one way to escape the heavy concentrations of boats is to head out from the jetties and enjoy the offshore. Don’t forget the sunscreen, as the sun is intense, and that warmth of the season along with good fishing and crabbing, make Memorial Day Weekend a very special time of year. Keep up with Joe Kent’s daily fishing report here. 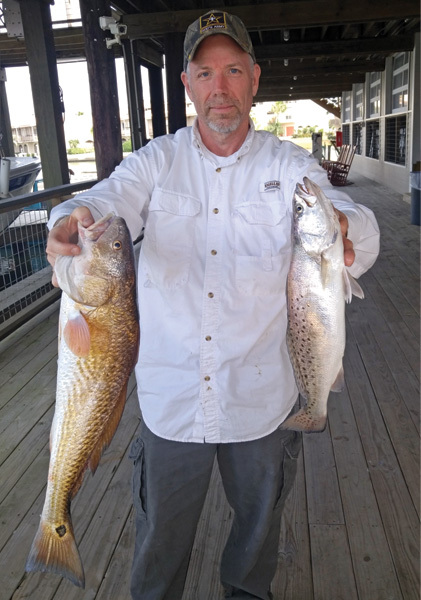 Doug Cadwell with a Texas two-fer of redfish and speckled trout. It has been said that the older you get, the faster time goes by. It seems like only yesterday I was penning my first article for 2016 and now I am writing the last one for the year. But 2016, for sure, is a year to remember. Winter started off typically here on Galveston Bay. In between fronts, the fishing held consistent. The upper reaches of the bay, Scott, Burnett, Crystal and West Galveston Bay lived up to their reputation as winter hot spots. 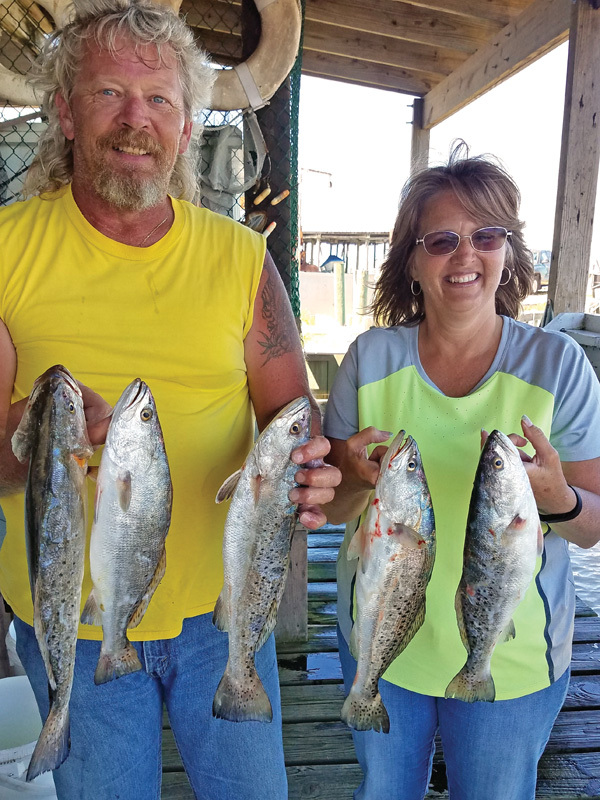 In March, and the first two weeks of April, fishing really turned on in the Texas City/ Eagle Point area for speckled trout. Great catches were coming from both locations. 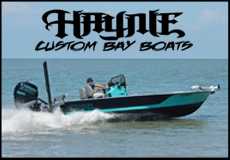 This sure did set the stage for Galveston Bay to have an epic year of fishing. In mid-April of this year, an upper level low stalled over the Rocky Mountains. During the overnight hours of April 16-17 and into the morning of the 18, Houston received over 17 inches of rain, the most since Tropical Storm Allison in 2001. The resulting runoff from this event flooded Trinity and Galveston Bay. This fresh water pushed the fish into lower Galveston and East Bay. East Galveston Bay remained the best location until about the last week of May. The fish began to move back up north, following the flow of saltwater back into our bay system. Everything seemed to be getting back to normal until June 3, when the Houston area received even more rain! Another runoff event ensued, turning our bay fresh and off-colored. 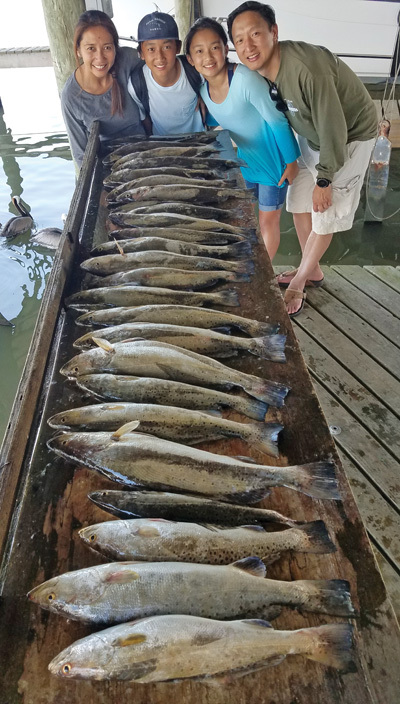 This time though, while some fish retreated back to East Galveston Bay and further south, lots of fish stayed in the area. They sought deeper water along the spoils and gas wells. 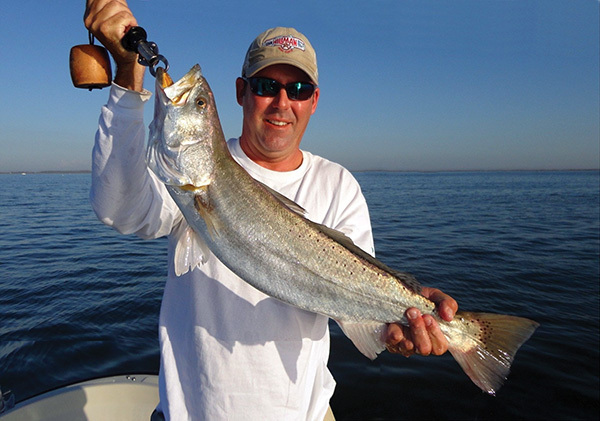 As we moved into June and August, the area along the ship channel spoils and gas wells, known as the A-lease wells, saw very good numbers of speckled trout and redfish. 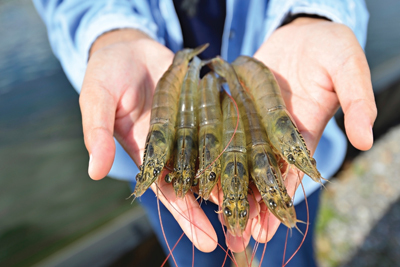 Limited supply of live bait was a problem for area fishermen during the first few weeks of summer, another adverse effect from the June flood. 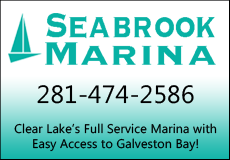 But by the third week of July, Galveston Bay and the fishery was back to normal. Towards the end of August, we started seeing fish make a move back into Trinity Bay and farther up the channel, a normal movement that happens every year. 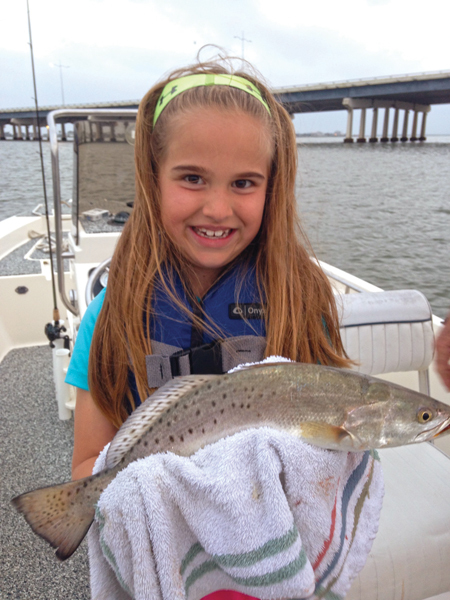 September is a month of transition where schools of speckled trout are harder to locate. This certainly was the case this year. 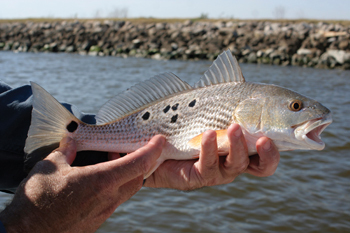 Scattered catches of redfish and speckled trout were the norm. By the end of September and the first week of October, as I type this article, fishing for trout has seen an upswing. But the problem we are experiencing is the size of the trout. Numerous undersized fish are being caught, compared to keepers. I believe this is due to the higher than normal water temperature and tide. I am optimistic that November and December fishing will get us back on track for numbers and size of trout. We are finally experiencing some cooler weather with the passing of a couple fronts. Although a true cold front has not passed, water temperatures have cooled a little. The first cold front should help drop the tides and flush the bait out of the marsh and inlets of our bay system. This should help fishing tremendously. Eagle Point Fishing Camp will maintain a good supply of live bait through the year. Remember to be courteous to others on the water. Happy Thanksgiving, Christmas and Holidays to all! Anglers fishing the Galveston Bay Complex often take for granted the positive effects of oyster reefs, both live and dead, on their fishing. That is until the reefs start diminishing and the fishing is affected. Let’s take a look at what we are discussing and how oyster reefs benefit fishing. Oyster reefs in Galveston Bay form in the open bay along the periphery of marshes and near passes and cuts and can be either subtidal or intertidal. The reef itself is three dimensional because oyster larvae settle on the top of old shells growing upwards through the water column above the established oysters. The shells create an irregular surface that support a myriad of small marine life. The oyster reef community is very diverse with a wide variety of shell fish, crustaceans and fin fish forming a balanced aquarium. Predators in this habitat include fish capable of crushing mollusks such as black drum, red fish, sheepshead, and blue crabs and stone crabs, which prey on small oysters with thin shells. 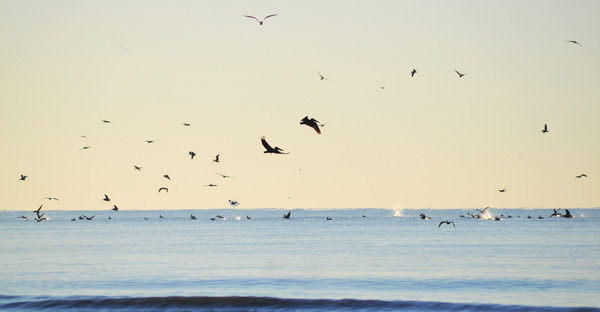 At low tide, birds forage on the exposed oyster reef habitat. 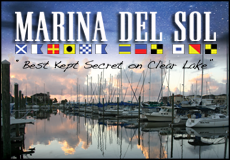 When Houston was first settled, an ancient oyster reef (Redfish Bar) separated Upper and Lower Galveston Bay. This reef stretched from Smith Point on the east to Eagle Point on the west and had only one small gap through which shallow draft boats could pass. There were extensive oyster reefs throughout Trinity, East and West Bays as well. Just about every species of fish caught in Galveston Bay can be found on or around oyster reefs. In the latter half of the 19th century, oyster shell became a construction material and was commercially harvested. In the first half of the 20th century, oyster shell became an industrial commodity and shell dredging intensified. Millions of cubic yards of oyster shell were removed from the bay, some of it from living reefs. This practice, which greatly reduced the area covered by oyster reef habitat, was prohibited in 1969. Hurricane Ike had a tremendous impact on oyster reef habitat in Galveston Bay. The Texas Parks and Wildlife Department estimates that approximately 60 percent of the oyster reef habitat in Galveston Bay was covered by sediments as the storm surge moved through the bay in September 2008. Scientists do not know how long it will take for the reefs to recover. With this background on the makeup of oyster reefs and how they are formed, let’s visit about fishing the reefs. In my childhood years when first learning to fish Galveston Bay, oyster reefs were the prime target. We did not have electronic equipment to locate the reefs, just a long pole that we bounced off of the bottom. If the pole had a soft landing we kept moving until the pole struck something solid and we had found oyster shells. 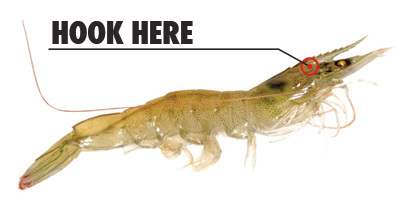 Just about every species of fish caught in Galveston Bay can be found on or around oyster reefs. Fish with scales and tough mouths, such as sheepshead and both black and red drum, feed along the shell while consuming crabs and other crustaceans. Speckled trout also are common around the shell; however, they do not have the physical traits to actually feed along the shell itself. Trout do not have scales and their mouths are softer than the main predators feeding in and around the shell. Trout like to feed just off of the reef during tidal movement which flushes the small marine life from their shelters. Seasoned shell reef anglers know how to fish the reefs and plan their strategy based on tidal movement. 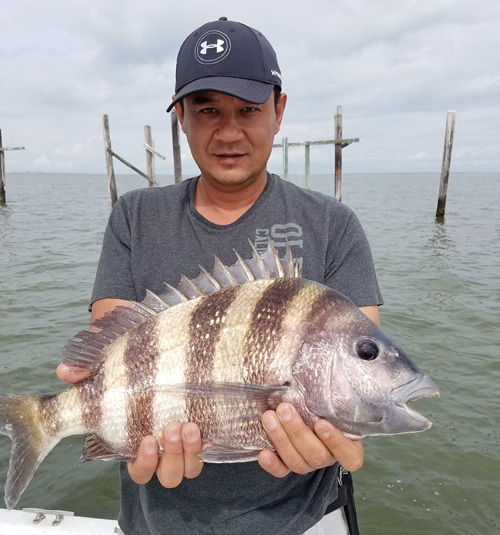 During slack or weak tides, they will focus on the reef itself as drum sheepshead and reds and other tough skinned, strong mouthed fish will be working the bottom. When the tide starts moving, then trout on the periphery will be the target. Trout will be found on the reef itself; however, they tend to be cautious as the edges of the shell can be razor sharp. Anglers have been reporting reduced catches in Galveston Bay over the past few years and one of the culprits likely is the reduction in acres of oyster reefs. Hopefully our restoration program will prove successful and the sooner the better.